Our courses are designed so that once you complete it, you go off with the information you have learned you and start the next day putting into practice what we covered. Many of my students leave their day jobs within their first year. These are the new tools we will add to your “how to profit from property toolbox”. #5 Creating a 10k per month cash-flow and not owning any properties! Title Splitting – Buy one, get one free!! Glenn has an ability to make something seem so left field. Such a light bulb moment. My head is scrambled with knowledge, must put in place to reach my financial goal. My back ground is managing a photography studio; I am an amateur investor who has been taught to follow the conventional method. This would never get me to where I want to get to within the time constraints. Thank you to Glenn, Tony, Steve and Mel. “I am an ex- builder/ Property Maintenance, not working for customers anymore. Concentrating on managing and expanding my portfolio, will be systemising everything. “I am an amateur property professional. I have known for over 12 months that I will make property/developments and investments my career, hobby and passion for life. I am a full time employed as a designer and have now started a small Architectural business also. “I am a property investor of 8-9 years, currently running and working within 3 businesses and running my own property portfolio. I was sceptical about coming on this course BUT my view has changed and I really enjoyed the education Glenn and his staff have provided. It has given me, a royal kick up the back side as I believe we are sitting on some extremely interesting and potential deals. “Ex Location manager/ Production manager- now full time property investor in London and Birmingham. The phrase ‘You don’t know what you don’t know’ has never been truer than this weekend. I’ve been gobsmacked by the volume, relevance and practicality of the strategies on offer this weekend. I have built up a good store of knowledge and strategies over the last 3 years, but this 4 day course has opened my eyes to a whole new realm of possibility within my grasps. I cannot recommend this course highly enough an intelligent, practical, real world information. A whole new buffet of strategies to pick from. “Been property investor since Sept 2007 and Glenn’s ideas are very logical. Some of his ideas I had never thought of. We came here to learn more strategies and definitely did! 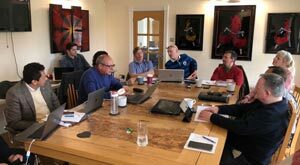 It was an eye opener because it made us look at our recent deals we have done, we could have made more money on them if we knew of the knowledge we learnt this weekend. Thank you very much Glenn and the Team. “Partner in a very low energy building and property development company in South East London. We specialise in transforming run down properties into funky stylist homes by adding value through, extensions re configuration and new builds in gardens. “Newish to property, parents are investors and I have been shadowing my dad the last few months. Came here for the education to help be a more effective part of the collective business as a family but also to launch myself forward in my own right moving at a faster pace than I am investing with my parents. I enjoyed learning all the strategies and having my mind opened to what is possible and what I can achieve. Prior to attending I had renovated a house and sold it on and thought I’d continue in the same way but although I may still do this my mind has expanded to new ideas. “I am a Business Development Manager at AXA Assistance, also qualified personal trainer achieved MBA 2005. Spent 6 years a Project Manager in pension’s buy-out companies and 14 years in pension’s admin. My experience in property is limited-very much a starter. The course has given me the potential to use many different methods to help me achieve my goal of 10k per month in 3 years. Glenn clearly has huge experience and an excellent problem solving brain. I look forward to this mentorship programme and working with Glenn and making me, Glenn and future partners lots of money! “I have learnt more than I ever imagine I would. I would have done a few property training courses in the past and thought I knew enough to build a successful property portfolio and cash flow enough money to be financially free. Now that I have been educated by Glenn I now realise I was lacking the correct information to achieve significant success. “I wish I had attended this course 10 years ago. “Site Construction Manager on large one off developments with values of 3 million pound plus. I am surrounded by developers 24/7 for 2 years. I have learned more in 4 days and have seen how much my employers have been leaving on the table. I love how personal the whole team are and actually can’t believe how quick the whole course went. “I enjoyed the 4 day property intensive, very informative. I work full time (4 day on-4 day off) so have a lot of time to invest, I have a property that is let out. Looking to get the next, next, next. “I have been running my own business for the last 12 years, it has been successful however I am constantly exchanging my time for money and that will not change unless I change it. My goal is to turn £100k into 1 Million within 3-5 years and by putting into place everything I have learned on the course and with Glenn’s help I now believe that goal is achievable. “As a person who has worked in the property industry for 7 years I was surprised by how much new information I was provided by the course. Not only was it informative but very enjoyable and Glenn was an entertaining person to learn from. “I am a novice investor. I just bought my first property in March. I first saw Glenn when he was speaking at the Berkshire Property Meet. I knew there and then that he was the right mentor for me. I came on the 4day property course and he blew my mind with his crazy but very legal property strategies that I’d never ever heard of before. I can’t wait for my mentorship program over the next 18 months. 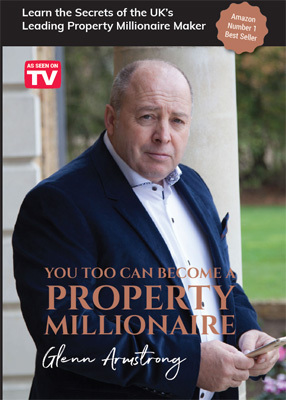 I’m going to be one of his first 100 property millionaires. “Property Developer, Builder, low energy, new build specialist. “Huge advantage, strategies, networking contacts. “I am an interior designer with a background in psychology. “Very good 4 days training. Learnt some new ways of doing things and made some great contacts. Want and need more info. Can’t wait to start the mentorship program, Partnership Program and also to do a day with Ashley on the Rent to Rent program. I am planning to find out what I can do next, which will help me get to the next level. “Well what can we say other then ‘Bloody Marvellous’. You really don’t know what you don’t know until you attend the 4 day course with Glenn. We run a construction company, Adi has 25 years of experience in the building trade and I have a background in H & S and now run a network Marketing Company. The knowledge we have gained today is priceless and I am confident it will accelerate our success to levels we may have only previously dreamt of. “I’m a property investor with 3 houses and 14 rentals. I have a Lettings Agency and Estate Agency. These 4 days have been brilliant. Glenn has focussed by brain, given me strategies to make more money and made me realise the business I am in.